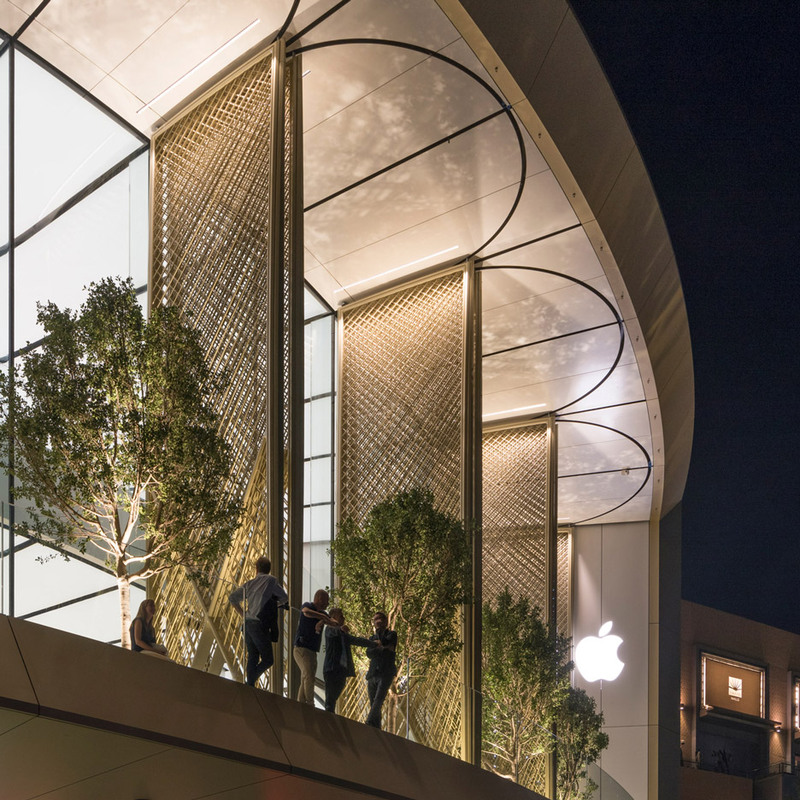 Foster + Partners has designed a succession of Apple Stores that implement the tech giant’s retail vision. From Paris to Istanbul, here are 10 of its best designs. Apple Zorlu Centre in Istanbul was the first Foster + Partners-designed Apple Store to open. Occupying two storeys below ground the store is topped by a glass cube that rises within the plaza of a shopping centre, offering visitors views inside. 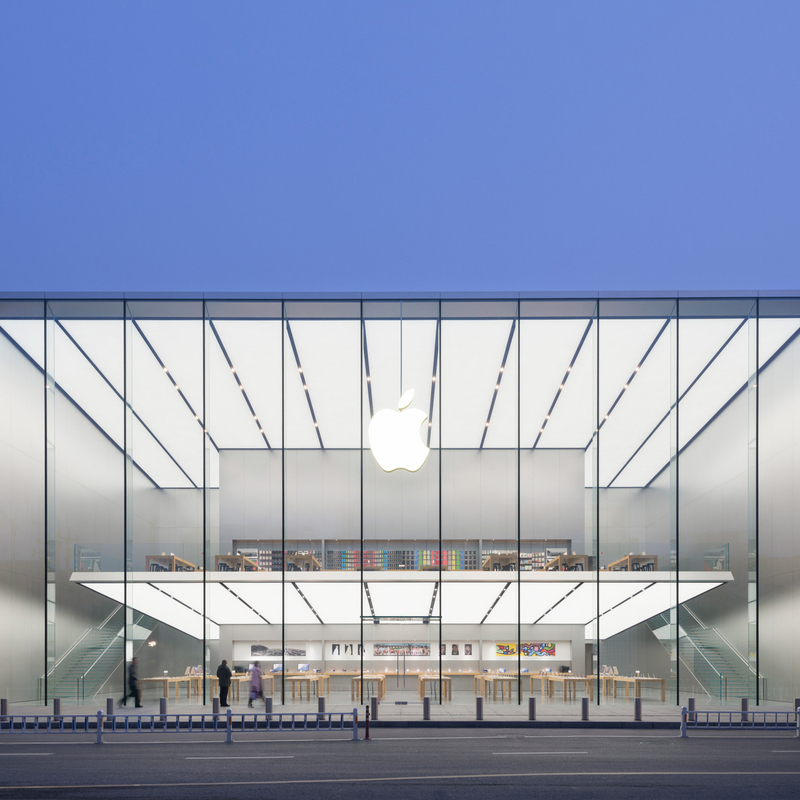 One of Apple’s largest retail outlets in Asia, this store is a 15-metre-high glazed box with a cantilevered floor and glass staircases. Its facade is made up of 11 double-glazed panels that can be shaded by mechanically controlled blinds concealed within the ceiling. 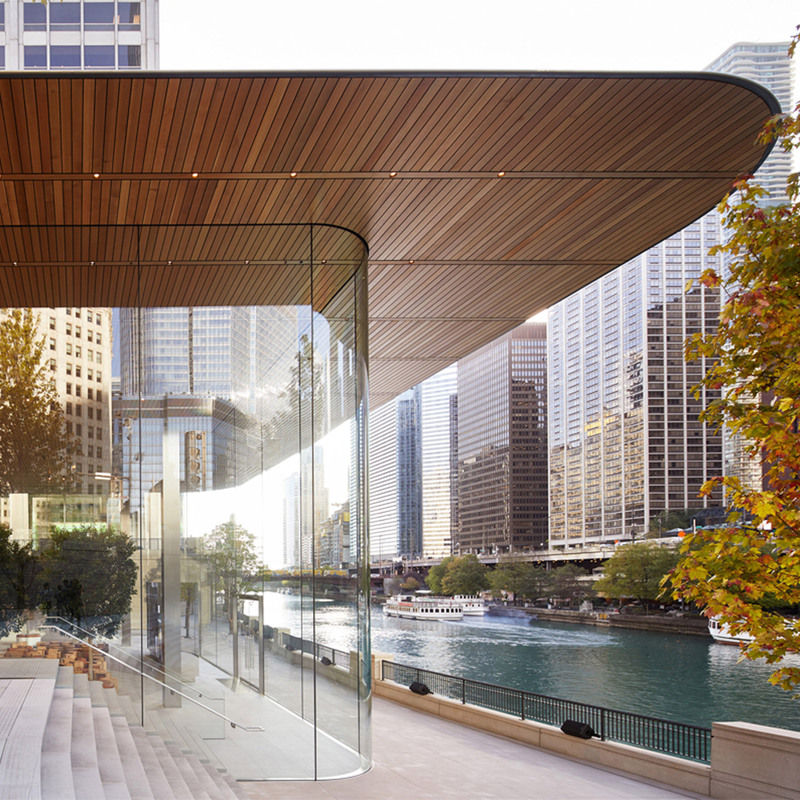 A slender carbon-fibre roof designed to resemble a scaled-up version of the Apple’s Macbook characterises this store on Chicago’s waterfront. The glass-walled building is flanked by two granite staircases that create a pathway from the neighbouring plaza to the river esplanade. 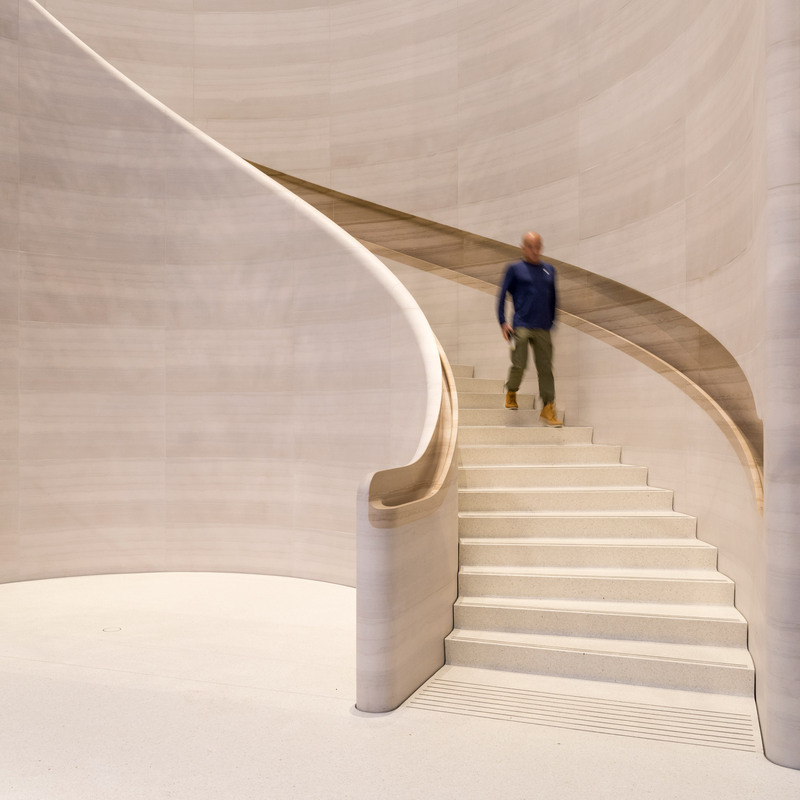 Potted trees and sweeping staircases hand-carved from stone characterise the Apple Store in Singapore. Like several other of the shops designed by Foster + Partners, the Singapore store incorporated greenery, with eight mature trees outside its entrance and 12 ficus trees inside. A 56-metre-long sweeping terrace wraps around the oriel window of the Apple Store in Dubai, giving views across the city and of the Burj Khalifa. It features intricate carbon-fibre shutters, modelled on traditional Arabic mashrabiya, which can be used to shade for the shop during the day. 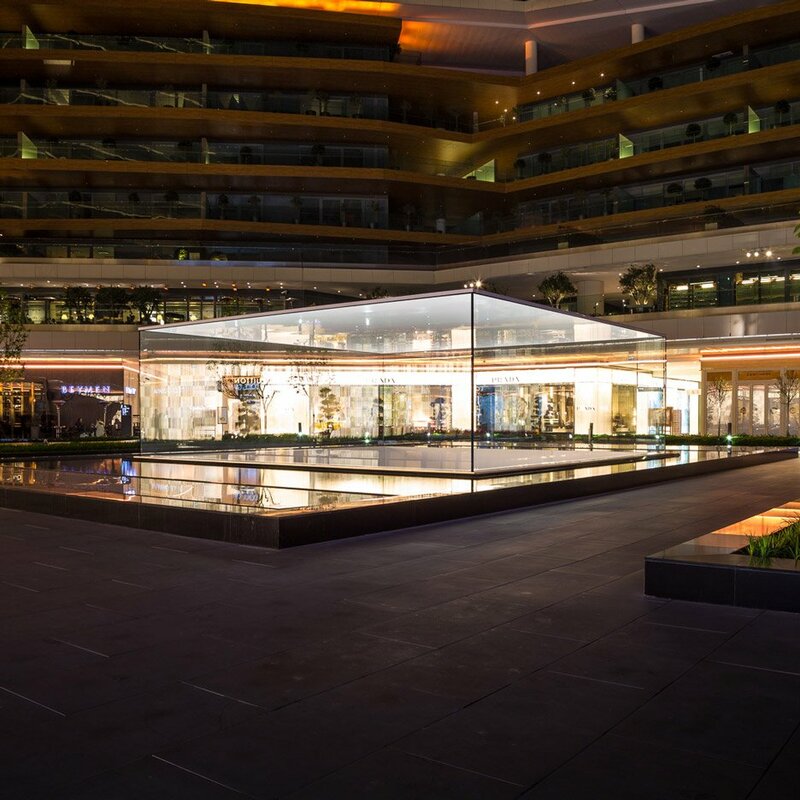 This cuboidal Apple Store in Cotai – a reclaimed island near Macau – has a translucent facade made from a composite of glass and stone. The building incorporates bamboo both externally and internally. It is surrounded by a dense thicket of the plants and has a “grove” of bamboo growing through a central atrium. 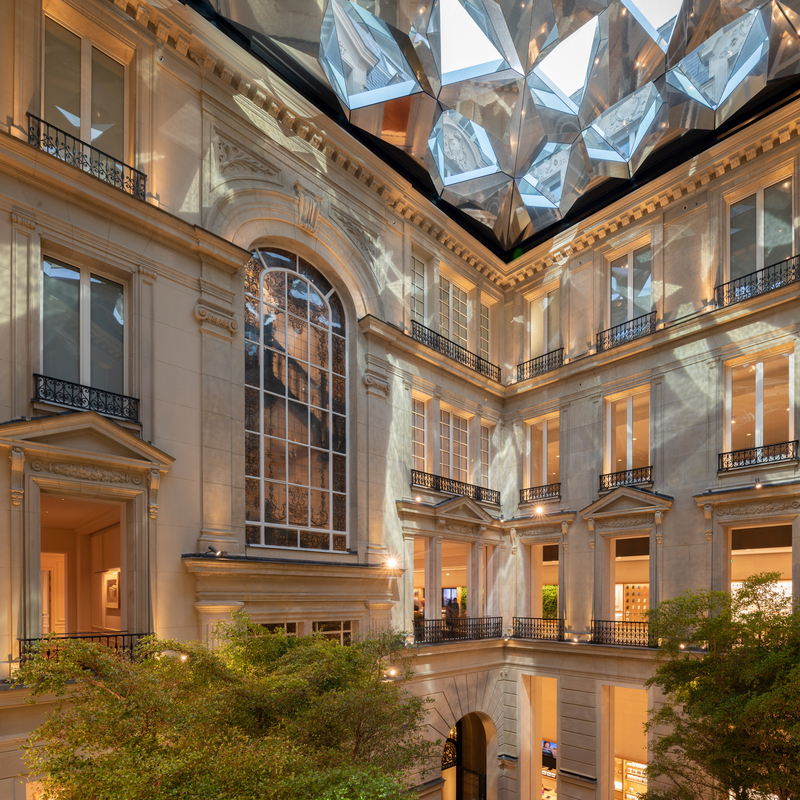 One of Foster + Partners most unconventional Apple Stores is located in a 19th century apartment block on Paris’ Champs-Élysées. The store surrounds a central courtyard, and is topped by a kaleidoscopic solar roof that reflects dappled sunlight around the building. 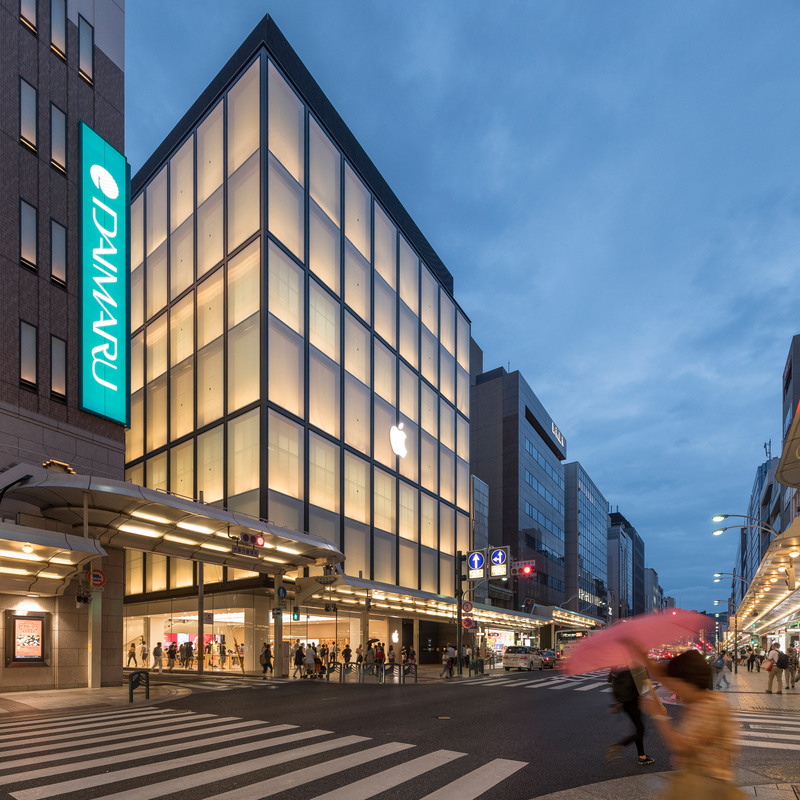 Apple Kyoto is distinguished by its giant translucent facade that is modelled on the materiality of traditional Japanese houses and lanterns. It is made from glass covered in printed dots within an aluminium frame, and stands in front of an internal wall made from paper panels. An eight-metre high water feature fronts the Milan outlet, which Foster + Partners sank into a traditional Italian piazza. It is positioned at the end of an amphitheatre, which is intended to give visitors the child-like excitement of “walking into a big fountain”. 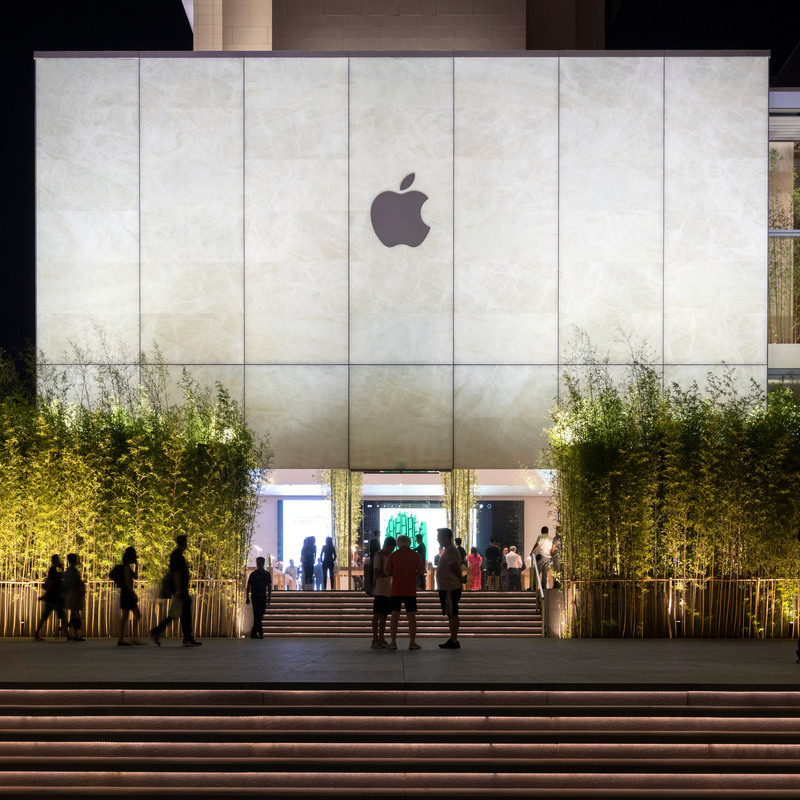 Fronted by two expansive glass facades and lined with indigenous trees, Thailand’s first Apple Store was designed to blur the boundary with the adjacent plant-filled plaza. It is topped by a large overhanging roof lined with timber, and supported by just four columns that provide a spacious, open-plan interior. 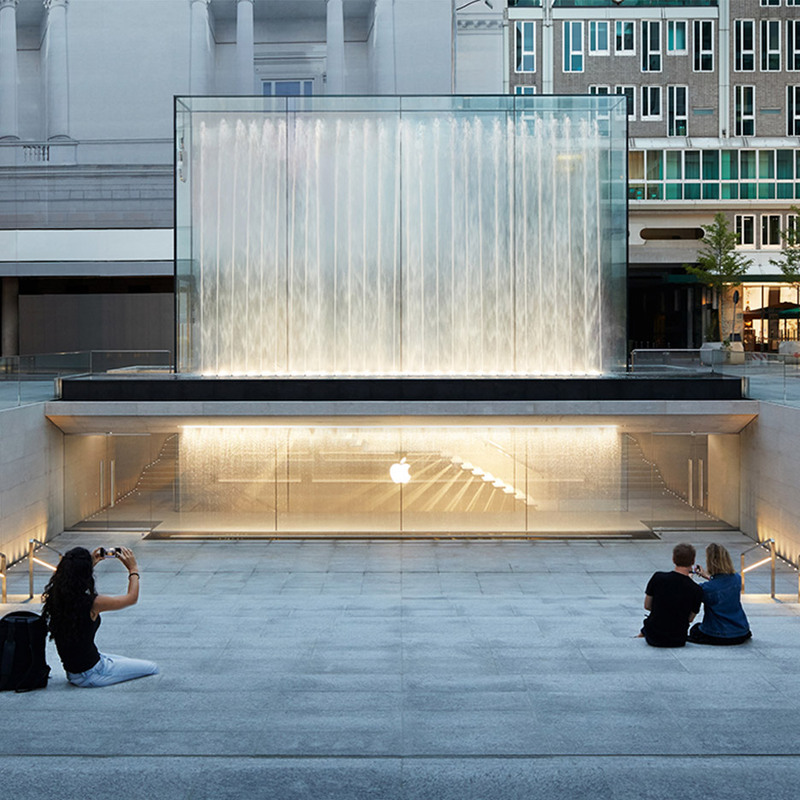 The post 10 Apple Stores by Foster + Partners appeared first on Dezeen.